In keeping with this era’s current gaming climate, 2015’s Pillars of Eternity ended up being quite the polarizing CRPG. Sure, daring to be the next Baldur’s Gate or Icewind Dale is already enough to earn a fair amount of derision amongst the genre’s diehards, but after the poor handling of the tombstone controversy and refusal to address some of the title’s obvious balancing issues concerning enemy movement and engagement (How many times did your Aloth die? 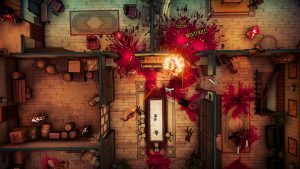 ), it fell far short of the mark Obsidian had set for it and was overshadowed by other more polished entries such as The Witcher 3 and Divinity: Original Sin. Regardless of how the game is viewed by a large portion of the community, I still found it to be an enjoyable CRPG that allowed for an impressive level of replayability thanks to its deep mechanics and remarkable receptiveness towards theory-crafting as well as it giving me the option to create my own handmade party. It was a D&D munchkin’s dream game, complete with overflowing chests of laughably powerful loot and ridiculously over-leveled nonobligatory boss battles. 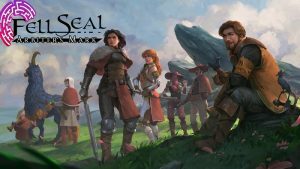 After four trips and 300 hours, I still found myself entertained with what that simple kickstarter RPG had to offer. Naturally, it wasn’t perfect, and I assumed that the imbalances, sloppy writing, awkward weapon specialization system and the lack of any campaign non-linearity would be addressed in the upcoming sequel. With that sequel now in my hands and having been picked apart by me over 50 hours of gameplay, I’d have to say my assumptions were correct. 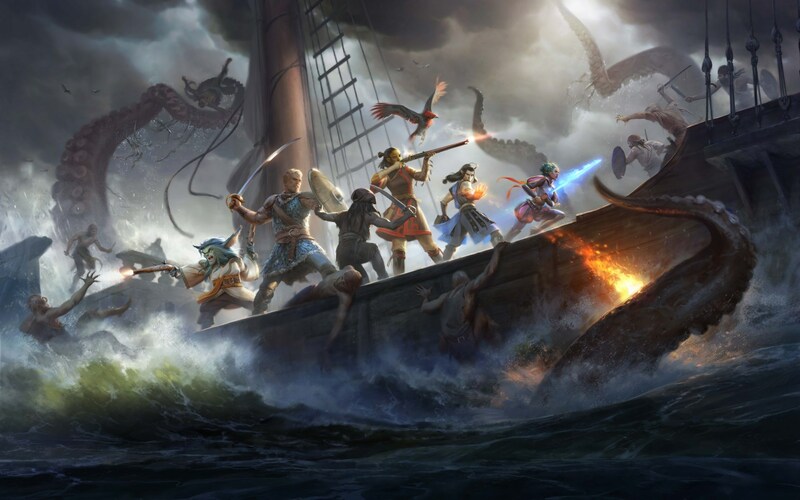 Pillars of Eternity 2 starts off with your main character, whom you may import from the first game, chasing after a giant statue possessed by the god Eothas as the errant deity stomps their way towards the Deadfire Archipelago. The statue, which was the adra carving that sat below your castle of Caed Nua, not only smashed your stronghold to bits, but managed to absorb the souls of anyone that came into contact with it and leave them a decaying husk. With what remains of your “army” on board a rickety boat, your hero sails out to sea in pursuit of Eothas for not only revenge, but to prevent anyone else from being absorbed by the rampaging god. What follows is best described as Assassin’s Creed: Black Flag the late 90s RPG, since many of that game’s more enjoyable features are done here, only in turn-based format. Most of the game revolves around you micro-managing your ship’s crew – as well as the ship itself – and heading into various tropical island ports to resupply and seek crew members. It doesn’t sound exciting, but as you get better ships, more cannons, and more experienced crew, the battles you conduct on sea begin to eclipse the ones you have on land by considerable measure. 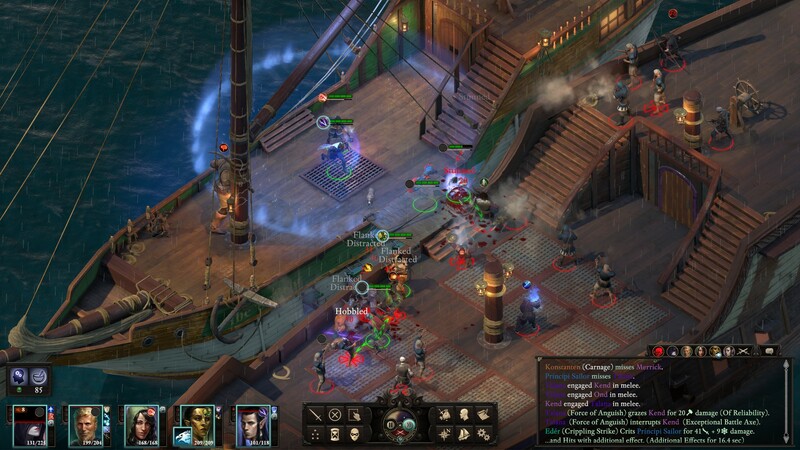 It seems odd to talk about the sea battles before any other of the game’s mechanics, but since it plays such a sizable role in the story and mastering it is required to take on at least a third of the available side quests, it’s the one thing Obsidian needed to get right to make the game work, and fortunately for them, they did. Conducted in the choose-your-own-adventure stylized interface that the first game’s competency checks were often handled by, Deadfire’s naval combat is similar to Skies of Arcadia’s own airship battle system which relied upon timing and turn planning. Much of the skill in winning a battle on the high seas comes down to being in the right position at the right time and having the right crew members doing the right things to secure a hit. Though it sounds complex, it’s quite simple and provides a nice change of pace to players that may get tired of dialog box reading or dungeon crawling. After all, nothing beats pulling out of port and hunting down a few slavers to bolster your food and drink stores. Especially when the battles are described so dramatically in the game’s interface and do their best to get you pumped up with sea shanties being sung in the background. Battles require you to maneuver your ship in order to line up shots with your cannons, then deal with the enemy’s own artillery fire by commanding your crew to recover from the damage. Distance, speed, hull strength, and even crew competency all play large roles in whether you succeed or not, which makes for a surprisingly tactical affair…especially considering this was talked about as if it was a mere mini-game. If you hadn’t guessed already, the sequel is all about pirating, sailing, and discovering tropical islands in a vaguely carribean setting. What’s so intriguing about it all is that rather than hop from point to point via a static overworld, you have to personally navigate through open waters on an ever-changing map that has several factions sailing around and guarding shipping lanes while you chase after Eothas. 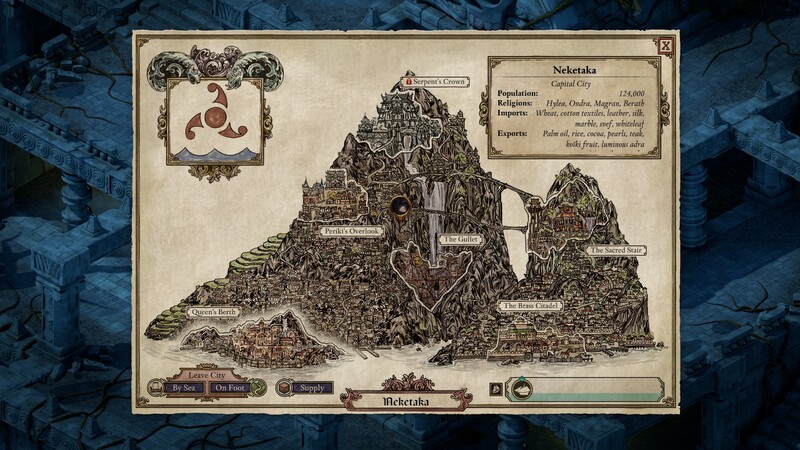 The world is quite large, as are some of the game’s major towns. So large, in fact, that there were times I neglected to go to certain quest givers simply because doing so would take too long. This can be a plus or a negative, depending on how keen you are towards expansive landmasses and lost free time, so consider that before hopping in and expecting the first game’s tighter and more condensed game world. Regardless, I loved the sailing mechanic, even if it did bring back the stress-induced eye twitch I gained from a year of playing Windwaker on the Gamecube. Fortunately, not everything is done on the sea, and you’re eventually going to have to disembark from your soggy wooden castle. When you do, you’ll see how much more improved Deadfire is over the previous game. Let’s get it out of the way right now: Combat is much more balanced and tactical than what was implemented in the previous entry. 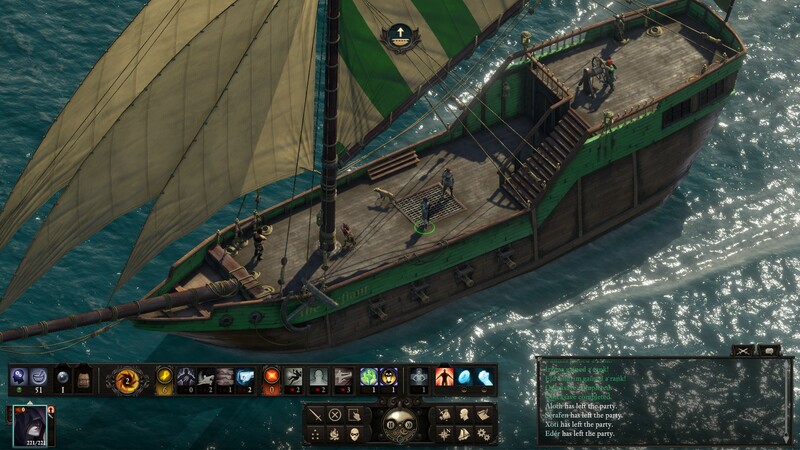 Borrowing what little good remained in Obsidian’s under-performing RPG “Tyranny”, Deadfire shows that the developers have learned from their mistakes and created a much slower, more user-friendly battle system than anything they’ve used before. All of the “fat” has been cut from the first game’s combat to create a more logical, slower, and easier to control system that, at least in my opinion, is the best implementation of “Real time with pause” I’ve ever seen in an RPG. First of all, weapon specializations are no longer tied to weird groupings that make no sense. This means no more learning how to use great swords just to gain skill with a firearm. Instead, each specialization is taken individually, and when you elect to train in one you don’t gain a bonus to hit, you instead unlock special modes of attack and/or defense that wouldn’t be available to someone not trained in it. This unlocks a tremendous amount of min/max’ing and theory crafting, since each of the game’s three dozen or so different weapon types have an ability that can drastically change the way a character is played. Take for instance the plain, ordinary dagger. Mostly useless in the first game and usually passed up by rogues in favor of dual hatchets (thanks to their deflection bonuses), the dagger now adds a mode of attack that greatly increases your defenses while slowing down your attack rate, allowing a dual dagger wielding rogue to finally be a viable frontline build in the series. There’s also bonus modes for shield specialization too, depending on their size, as well as modes for spears that increase engagement limits and options for firearms that add large area-of-effect damage at the cost of temporarily blinding nearby allies. It all combines to form a much more improved weapon specialization mechanic that I hope they keep around for the inevitable third game in the series. There are other changes as well, such as no penalties being applied to someone who uses a weapon they aren’t proficient in (You just won’t get those new modes), as well as making pistols a one-handed item capable of being dual wielded. It’s also nice of the developers to finally do away with the awkward pierce/slash/crush nonsense and replace it all with a flat “armor pierce” statistic that works on all defenses across the board…so no more being forced to carry a second weapon around just for crush damage. Also making up for the first game’s miscues in combat mechanics would be complete removal of the “endurance” stat. No longer do you have to rest to regain endurance due to taking damage, since now your health automatically refills after the end of every battle. While this sounds like it makes the game easier, it is balanced out by the fact that the average damage of weapons in the game is about double what it was in the first game, which means the time you save worrying about endurance will now be spent worrying about heal rates and in-battle buffing auras. Surprisingly, it all balances out. There are other wonderful quality of life additions to combat now, such as your spells refilling after battle, a new “empower” ability that will replenish your limited time abilities during a fight, and each class having its own resource that governs the use of their skills rather than an obnoxious cooldown timer. 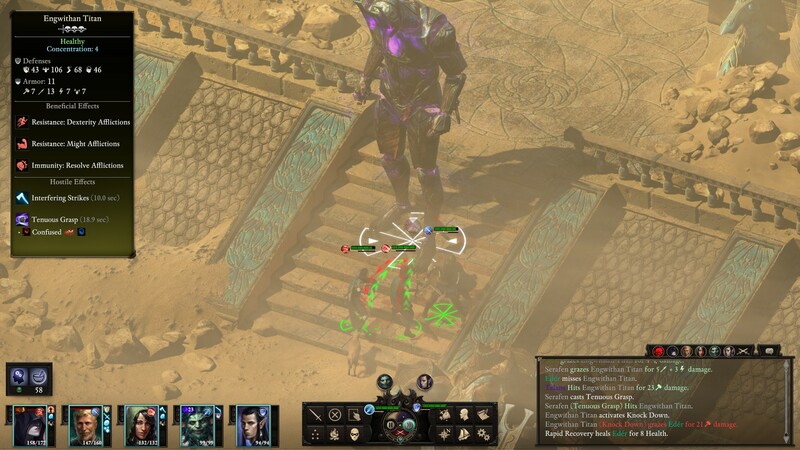 Overall, I was very pleased with these changes to the core Pillars of Eternity combat engine and noticed that not only were fights easier to micro manage now, but also ended quicker. How you can slow down turn speed and yet still make the combat shorter is beyond me, and whomever is responsible for designing the new battle mechanic needs to be given a raise. So what about character creation? One of the more talked about additions would be the ability to multi-class, and while I like the idea, I don’t like that multi-class characters cannot select abilities from the last two tiers of either of their classes. From what I’ve been able to see during my trip through the game, it hobbles most of the builds since those last two levels, especially for Ciphers and Priests, contain the most valuable additions to their repertoire. That being said, it does work…in some cases. Fighter/rogues become godlike entities capable of not only tanking, but doing absolutely broken amounts of frontline melee damage. Combine the engagement bonuses and graze-to-hit chances of the fighter with the dirty fighting, flanking/backstabbing, and increased critical chances of the rogue and you have a character that you can completely hand over to the A.I. script and never once touch their character portrait. After setting up the returning NPC fighter Eder as once such hybrid character, I realized multi-classing wasn’t completely useless after all. The skill tree and point buy system is much improved as well, with a simple “one point raises it by one” rule that throws out the annoying Shadowrun-esque stockpiling of points between multiple levels just to raise your lockpicking by one rank. Skill trees are just as simple, with a new “tier” opening up every couple of levels, and the player getting 3 selections every two levels to put into their build. It’s uncomplicated, straightforward, yet allows for a good deal of flexibility. Exactly what you’d want in a classic CRPG, and other than wasting a combined two hours in the game hemming and hawing over ability selections, I have no real complaints about it. Most of the spells and skills from the first game return, but have been tweaked to run on the new accumulated resource mechanic for each class instead of a cooldown or have been turned into entirely passive abilities. Due to this, a lot of the same tactics from the first game can be used in the second, which should please folks like me that enjoyed stacking engagement bonuses and a half a dozen aura effects. I mentioned it earlier, but I think the majority of the review up to this point can just be called an exercise in quality of life enhancements, since most of the game’s changes over the previous entry is just the developers cutting fat from the bone. A good example would be multiple item bonuses not canceling out the weaker of the two when you equip them. So rather than one of your two deflection rings being cancelled out because you are only allowed one of each type of bonus, the game allows you to equip as many of a stat boost as you want…so if you have five different items that increase strength and want to use all five to be a lumbering behemoth, you can easily do so. This makes fighter/wizards more of a do-able build since you can merely stack constitution and deflection items all on the same character without penalty or cancelling out. So what do we have so far? 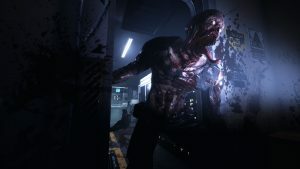 Amazing combat, heightened opportunities for build creation, more user-friendliness, a great ship battle mechanic and a bevy of quality of life enhancements that alleviate some of the grind present in the first game. But what about the story? The non-linearity? The actual roleplaying? The first Pillars of Eternity didn’t do too badly in that department, but even a fan like myself has to admit that no matter how many times you go through it, you’ll end up doing the same things in the same way without much deviation. 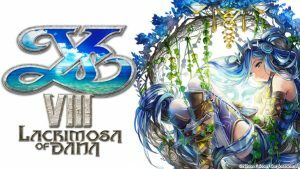 What the sequel does is, partly thanks to the large world size, allow you to decide where to go and in what order. Though the main quest is always waiting for you, the meat of the game, as well as the flavor and history that color the main questline, is hidden within the side quests. And good lord are there a lot of side quests. There’s a reason the difficulty settings have an option to auto-scale enemies, and it’s because if you get caught up in those side quests for hours on end, by the time you touch the main quest you’ll more than likely be too powerful for it. Since the game gives so many opportunities for RPG munchkinism, you can easily cheese your way through high level encounters not meant for your team, resulting in you gaining items and levels far beyond what you should. 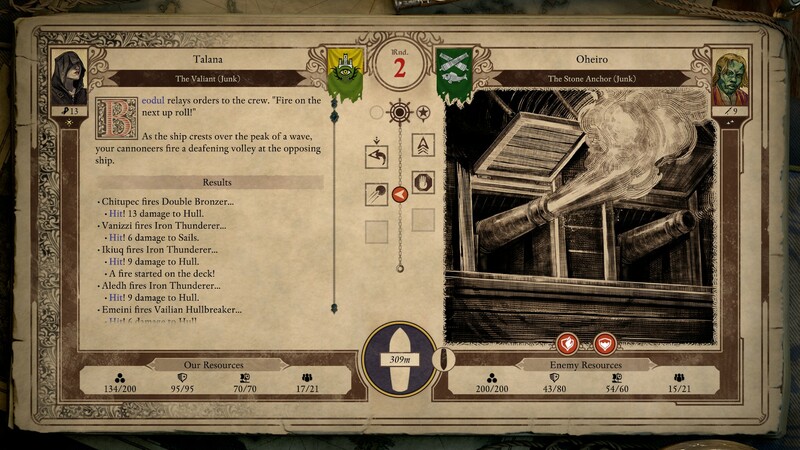 Now, whether that’s a good thing or a bad thing is up to the player, but one thing I will say is that this laissez-faire attitude towards quest ordering and making the map one giant waterlogged open world has created a game that can be as different and exciting with each play-through as you want it to be. Similar to Baldur’s Gate 2, your main quest isn’t even where you’ll spend most of your time, since the real fun is finding strange encounters on its periphery that tempt your curiosity. Which tells me the writers got a little carried away. That’s not always a bad thing, since it has also resulted in a lot of skill and competency checks during dialog. The one thing I loved about Obsidian’s Tyranny was that it based almost every NPC reaction and quest dialog around your player’s reputation and disposition. The same is done here, only even more overtly, with factions willing to divulge more information to you or people willing to stick their neck out for you depending on which attitudes you’ve exhibited during the storyline. This isn’t just for faction play, it also factors into your relationships with your party members as well. Nearly every interaction you have with others will affect your recruits, causing them to grow closer or farther away from you depending on how you handle yourself. Curse the gods and laugh at someone’s beliefs? Xoti, the priestess of Gaun, will be understandably upset…yet Pellegina, the bitter realist, might find it amusing. Bluff to an NPC to get ahead in a quest line? Sneaky Serafen will enjoy seeing your trickery, but no-nonsense Aloth will lose respect for you. It’s impressive how deeply this is all woven into the fabric of the game’s story and it shows that if they learned anything from their last two RPGs, it’s that the battle for a good story is won and lost in your reputation system. 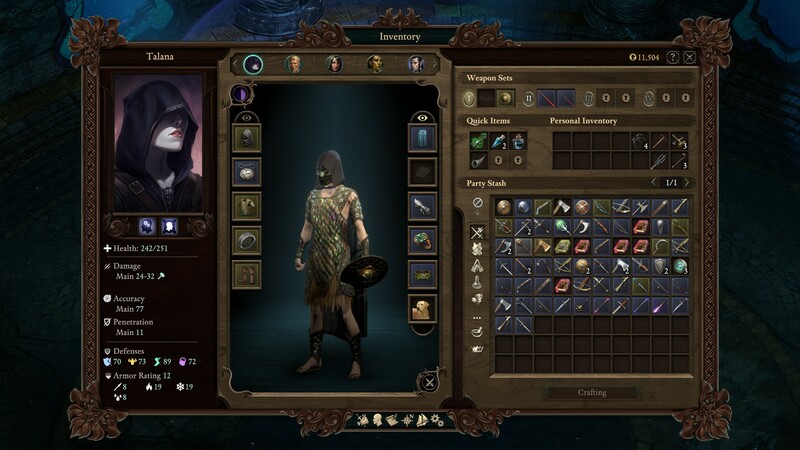 Since we’re on the subject of party members, it should be noted that the new recruits you have available to you in Deadfire are, at least when viewed as a whole, much better than the first game. Sure, there’s no one as well written or realistic as Durance, and there are no party members as devilishly sinister (or original) as The Devil of Caroc, but the average bar is set a bit higher this time, so there are no “forgettables”. 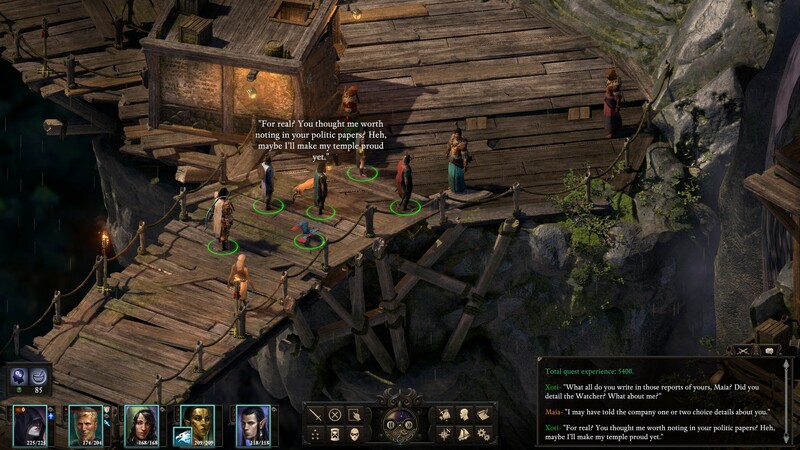 Those who import end game saves into the sequel, such as myself, will be happy to know that all of your choices do in fact affect the characters you meet in the deadfire. Besides your deeds altering how some factions see you (Kill a dragon and less folks want to tangle with you), the returning party members from the previous game will come saddled with the baggage you left them with. Eder begins pining away for his family and questioning his faith, Aloth becomes hard-hearted and far more mentally stable than before, and Pellegina…well, her status at the start of the game can vary wildly depending on how you handled her questline. Even Kana makes a cameo and makes several callbacks to your previous (mis)deeds. It’s good to know that while you couldn’t keep your levels, you can, however, keep your friends. Besides returning heroes like Eder, Pellegina, and Aloth (All of whom have changed and done some growing thanks to your choices in the first game), There’s Maia the ranger, a spy who isn’t shy about revealing what she reports about you. Xoti, an immature and naive priestess of Gaun who is the mirror version of Durance. Serafen, a lecherous pirate who enjoys screwing with people’s minds…and a few non-story recruitable henchmen that pad out the roster, adding a little bit of depth and flexibility without requiring you to handcraft your own party. Overall, I was happy with the new characters. While I don’t want to spoil anything, I felt the individual stories of your party members were more deeply associated with the main quest than what your party was in the first Pillars of Eternity. Maia is deeply rooted in a couple of the main factions, Xoti is basically being forced to confront her god at the end, and Serafen can be betrayed, or even betray you, if you choose the wrong path. It’s all beautifully tied together without any hanging threads, and the writers should be complimented for successfully navigating the dramatic twists and turns of a mammoth-sized 100 hour CRPG such as this. In closing, would it be fair calling Pillars of Eternity 2 the best CRPG Obsidian has made since New Vegas? I wouldn’t be afraid to say so. There is one very odd problem with the game that I couldn’t help but notice: the frequency of LGBT politics. I debated on whether or not to draw attention to this, but every time I swore to not mention it, another odd inclusion of homosexuality, transgender identity, or proclamation of bisexuality would rear its head. Making it even worse was that nearly every faction in the game was either headed by a stereotypically ugly/tough/bitchy female NPC that talked like they were acting in a Buffy the Vampire Slayer episode, or a sniveling wimp of a male that was blatantly corrupt and immoral. For reference, my only trip through the game so far was as a female Pale Elf monk. Knowing this, it should come as a surprise that not a single male NPC would enter romance with me, even when I maxed their reputation and asked for such a thing. Yet female priestess Xoti and the ranger Maia both hit on my character and asked to sleep with her within an hour of them joining the party. Serafen, the male Orlan pirate, mentions how he desired to have an attractive man share his bunk with him. Aloth, our famously nerdy wizard, meets his old gay lover in a brothel and has an awkward conversation while you watch idly by. The second in command of the pirates guild – who wants you to conspire with her to overthrow the corrupt male who runs it – also asked to sleep with my female monk the first time I met her. The most shocking of these inclusions would be a merchant in Delver’s Row that looked to be a man, but when I talked to the mind-reading vithrack in the next room, I found out that he was really a “she”, and was transgender. Though, to be perfectly frank, I thought that was handled humorously and hidden deep enough in a secondary quest so as to not be too jarring. Now it could be that all the characters are designed to be bisexual and can be romanced by either a male or female main character…which while I understand it, I think it cheapens the roleplaying. Fallout 4 did this and I didn’t approve of it there, either. Of course, it would’ve been nice if they let my female monk at least have a boyfriend. Eder rejected her, Aloth rejected her, and Serafen never even bothered…yet every female PC and NPC were drooling over my bedsheets and begging to be let inside. It left a bad taste in my mouth and held the game back from being the full-fledged RPG experience I wanted it to be. It was also the same exact problem I had with Dragon Age: Inquisition, only as a male main character. Though at least there, the ugly elf with the bad accent offered herself up once. Not that my hero took her up on it. It seems every single western CRPG is being written by jaded cat-lady lesbians in their early 30s who absolutely refuse to allow female main characters to procreate out of envy that they themselves cannot do the same. Sort of like Baldur’s Gate: Siege of Dragonspear, which had every female NPC offering to sleep with my female elf mere minutes from joining, but not a single male even so much as sniffing the air around her. I know, it’s funny, but it’s also depressingly sad that it has come to this. 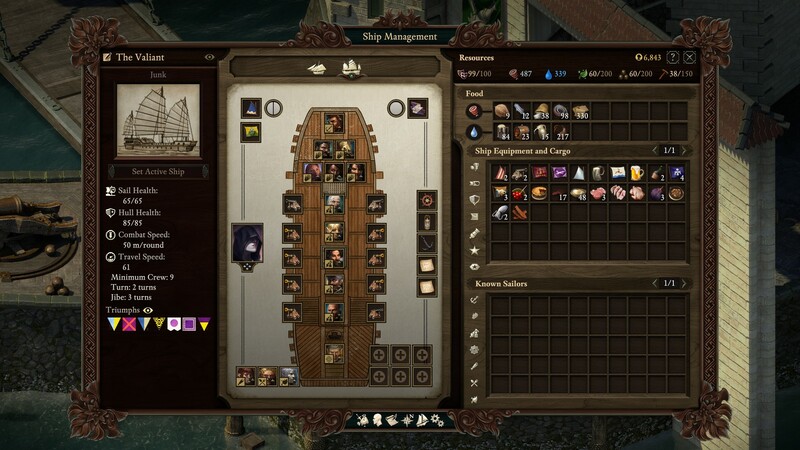 Regardless, Pillars of Eternity 2 is an excellent CRPG that improves upon the original in every single aspect, as well as creating the best naval combat minigame in the history of gaming. Combine that with the huge world, 100 hour quest, supreme non-linearity, and immense replay value afforded by the deep character creation and you have the one game you shouldn’t be allowed to miss this year. Unless you’re hoping to have your female main hero get drilled by a handsome, straight man. 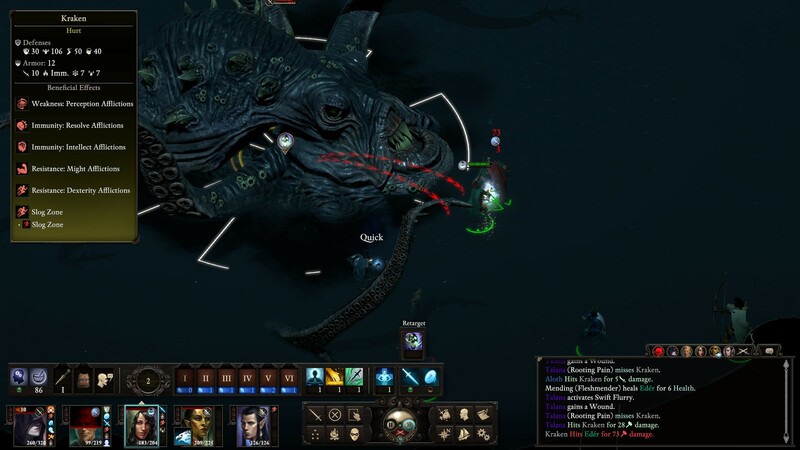 Pillars of Eternity 2: Deadfire was reviewed on Windows PC using a review copy provided by the publisher. You can find additional information about Niche Gamer’s review/ethics policy here. Carl is both a JRPG fan and a CRPG'er who especially loves European PC games. Even with more than three decades of gaming under his belt, he feels the best of the hobby is yet to come.